NHM HP Recruitment 2019: National Health Mission Himachal Pradesh Vacancy is out now. National Health Mission HP has announced the latest notification for the posts of Attendant & Other posts. There are 250 vacancies are available. The vacancy count may increase, which depends on the performance of the applicants. Well, the candidates those who wish to fill the Attendant & Other posts vacancy can check the application form available online from 10th January 2019 to 31st January 2019. Check more about National Health Mission HP Jobs 2019 here. 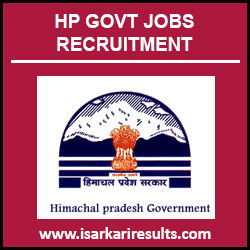 Applicants those who are applying for the NHM HP Jobs 2019 for the Attendant & Other posts should not wait till the deadline. Candidates can start filling your application from today itself. Because it is a government job with minimum Qualification with a decent salary. So many people will apply and there is a possibility of network error have happened. So applicants should give more importance while filling the application form. Scroll down below to get more details. Himachal Pradesh invites application from suitable candidates for the following positions for different health institutions throughout the state. Details of the vacant positions, remuneration, and the number of posts are mentioned hereinbelow. There are different trades are available and candidates cannot able to apply more than one trade. If applicants fill many application forms with same details then both the application form will be rejected. NHM is currently working in a task mode to achieve goals set-in for the state and effectively deal with the challenges. So it is planned to hire efficient and energetic candidates. Please check below to apply or know further details. Candidates those who are willing to fill the Attendant & Other posts have completed their basic educational Qualification. Applicants those who have passed 10th, 12th Class, Bachelor Degree, PG, Diploma, B.sc Nursing. Aspirants should come over the certain age limit to apply for this Job. The application form will be available till 31st January 2019. Further details like exam dates and scheduling interview which will be announced later in their official website @ nrhmhp.gov.in. Vacancies under National Health Mission HP are numerous. Out of which aspirants wish to apply for a few posts. To apply for posts like Attendant & Other posts there are thousands of candidates, for which applicant need to stay notified to grab the first opportunity. Moreover, applicants can get the eligibility details like educational Qualification, age limit, application fee and so on. Here, in this page, you can get all details related to NHM HP Career 2019. So do not delay to read the entire article. As per the recent National Health Mission HP notification 2019, the eligibility details for the Attendant & Other posts job has given below. It is very important to check your qualification for this opportunity. If you have less qualification, you may not able to apply for this career. Here below you can find age limit and educational qualification required for NHM HP job 2019. Other education qualification details go to the official notification. Candidates age limit should be Minimum 18 years & Maximum 45 years.